Okay, I know it has been a long time-too long-since I posted on here, but things have been extremely busy! Anyway, here is a slideshow I made from preaching at Beale Street this past weekend. As always, we had a ton of great conversations, as well as the usual hecklers. Beale St. is my favorite place to evangelize, as I get more discussion opportunities there than anywhere else we preach. I had the opportunity to debate evolution for a few minutes with a few college students, who had no answer for the question of where the information for life came from. One man said that Jesus had never existed; of course he walked off as soon as I tried presenting historical documentation. So, here is a video/photo collage I put together from our weekend at Beale Street. Enjoy! This past weekend we held our 2nd annual Kentucky Derby Street Preaching Blitz. Although we had some rain/thunderstorms on Saturday, the weekend went very well. Thursday evening we started off with singing and preaching at the camp. Friday we were out on the street from about 10:00 to 3:00. It was the normal atmosphere, with many "christians" telling us we were doing it wrong, drunks getting mad, etc. On our way to the area we usually preach at, a man in a golf cart drove by and started yelling at us. When a couple of the preachers responded, he came back, got out of the golf cart, and ran at us like he was going to hit someone. It is amazing how quickly the sinners get stirred up...we hadn't even started preaching, and they were already getting mad! Overall, though, Friday was a pretty mild day. Saturday was a little more wild. Due to bad weather, we didn't get out there til about 2:00, and the second we stepped out of the vehicles, you could feel the spiritual tension. Within 5 minutes of getting to the corner, confrontations and debates started! I was literally moving from one end of the line and back again, keeping an eye on which conversation had the most potential for aggression! It was a real blessing to have several men out with us who pretty much made it their sole job to bodyguard. During the last hour and a half out, we ran some "caution" tape between a couple trees, and kept everyone but the bodyguards and camcorders behind it. The whole spirit, atmosphere and even the women's dress (or lack of dress) was worse than it had been the previous year. The police gave us a little trouble, and right as we were getting ready to leave, an officer approached and said he was asking us to leave-there was too much aggression, and they couldn't be there protecting us when people got mad. When Dad read them the law about protecting those exercising their 1st Amendment right of free speech (even when it is unpopular), another office got mad and responded with some very vulgar language. They finally walked off a little ways, and as we continued to pack up, a couple Marines got mad and basically started a mini riot. The police moved in right away, including 4 mounted officers, and sent them on their way. Honestly, if we had stayed out longer (after the race actually let out), we almost definitely would have had a riot, probably even worse than last years'. Here is some video footage from preaching Friday. I'll try to get some up from Saturday by tomorrow. Here is a slideshow of some pictures from Master Club Regionals this year. Here are a few video compilations from this years Master Club Regionals Competition. Enjoy! I know I'm late getting this posted, but we've been pretty busy lately. The past 2 weekends we were out preaching at Spring Break. As always, most of the people we dealt with claimed to be Christians. A couple young men that Dad talked to admitted they would be getting drunk, and would even be out looking for girls, but said they were saved! It is amazing how low so-called Christians' standards are! The manager of the Walgreens store on the corner we preach at came out and argued with us as well. She also said she was saved, but said we weren't doing it right...the normal "you're judging me-Jesus didn't judge-you're too hard" spiel. She ended up getting so mad (after Dad pulled the Hezekiah question on her) that she literally was bowing down to Dad (mocking, of course)! The next weekend we were out, Walgreens put up a sign that read "We Do Not Support This Group". 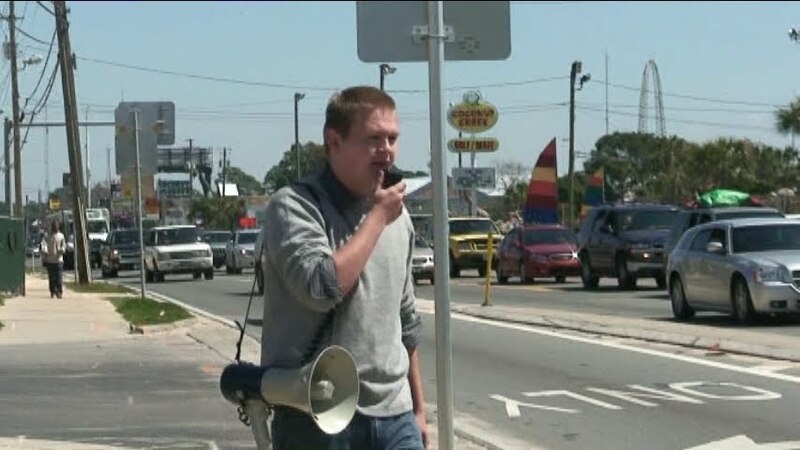 The best part was the next day when we came out to preach...the sign was off...looked like it was broken! Another man who came out said we were "building walls", and no one would listen....not even realizing he had come out, as well as 20-25 other people who were talking to various members of our street preaching group right then! Some people are so blind! Don't you love her sign?! Don't they look like trouble? Dealing with some people who "jumped over the wall" to talk to us! Josiah, M, and a friend from Church. I am putting a few minutes of video up here, but there is more on this Youtube channel. Here is the second video from preaching at Gasparilla this past weekend. There are several parts on here I had to mute because of the language.